We are very excited to officially announce the winners of our VEX Virtual Programming Skills Challenge for both VEX EDR and VEX IQ! Winners of each competition received an invitation for their team to the VEX World Championship — April 20-23, 2016 at the Kentucky Expo Center in Louisville, Kentucky. VEX EDR Winner: Friarbots B (Team # 3309B) from Anaheim, CA. The team member who received the high score was Matthew Krager. VEX IQ Winner: Flash Robotics (Team # 5194a) from London, England. The team member who received the high score was Dominic Vald. We look forward to seeing all them at VEX Worlds in a couple weeks! 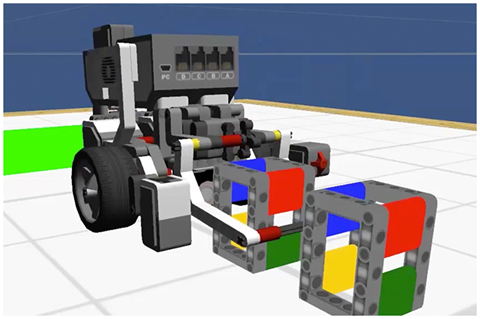 VEX Robotics recently released a brand new, free software called, SnapCAD, which is a community-built solution for designing virtual VEX IQ models. SnapCAD is a great option to test out a novel idea in the virtual world before building it physically, or to share your creations with the world in the form of step-by-step build instructions! We at Robomatter want to help you get started with an introductory set of tutorials videos! The videos cover the workspace configuration, creating a new model and adding parts. VEX has included pre-build models of all four VEX IQ Starter Kit robots, so we walk you through where they are and how to include them. The final three videos touch on part selection, positioning, rotation, and what the grid does. Download SnapCAD for free here! Then check out our tutorial playlist below or on our YouTube channel. And don’t forget about the VEX IQ Summer Build Contest where you could win a $250 promo code to use in the VEX IQ store! VEX Users: Program Virtual Robots Without Downloading Anything New! Have You Explored New Worlds with ROBOTC? ROBOTC has provided you with many challenges and learning opportunities, but did you know you can explore exciting new virtual worlds without downloading anything new? Try out Robot Virtual Worlds for FREE in ROBOTC with a 10-day trial! See the instructions to get started at the bottom of this email! What are Robot Virtual Worlds? 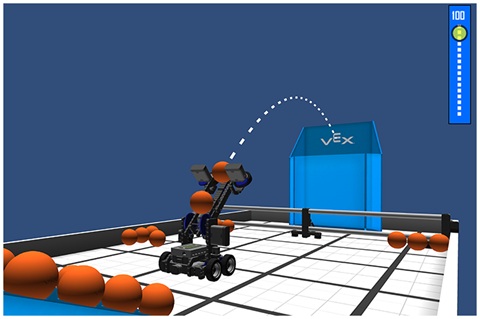 Robot Virtual Worlds are high-end simulation environments that enables users, without robots, to learn programming with game and competition worlds. Watch our video for more information! Escape to one of our fantastic game worlds where you can use your programming skills to explore and complete challenges! We thought Atlantis was a myth. We were wrong. Your mission is to explore the Ruins of Atlantis, 6,000 meters below the surface of the ocean, collecting data and treasure as you do. 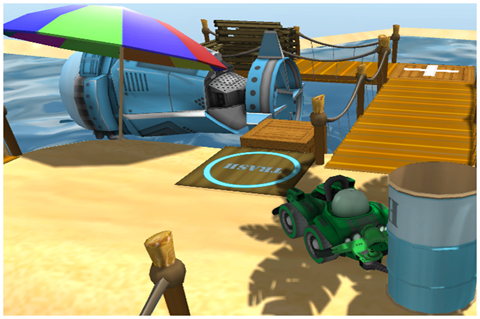 Visit the beautiful Palm Island and program your robot to drive along its boardwalk path. Collect coconut clusters and set lobster traps for the Luau. The mining colony of Alpha Base H99 needs your help! A terrible storm has damaged the colony’s equipment and we need you to use your programming skills to complete the mission. 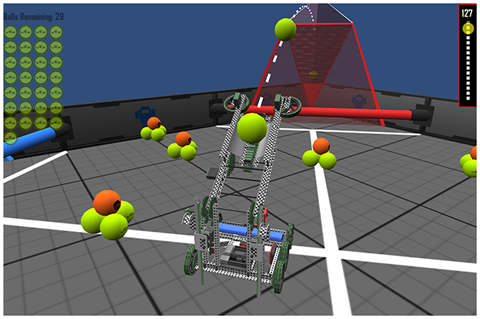 Practice your programming skills with virtual versions of popular robotic competitions. Try to get the most points by collecting and scoring the balls and bonus balls into the Low and High Goals. Elevate your robot into the climbing zone for bonus points! Get the highest score by emptying the ball cutouts, and scoring the balls into the scoring zone. More points if you can make a bank shot into the goal! Autonomously score as many cubes as possible during the time period. Zoom around the beltway to move around. Beltway is a modified version of the VEX IQ Highrise competition game. 1. Open ROBOTC (from the icon on your desktop or Start Menu). 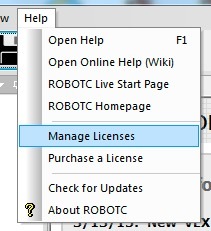 in the menu and select “Manage Licenses”. 3. 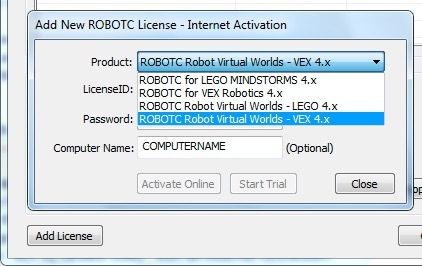 Click “Add License” in the menu and select “Robot Virtual Worlds – VEX” from the Product drop-down. 1. Click “Robot” in the menu and set the “Compiler Target” to “Virtual Worlds”. 2. Click “Window” in the menu and set “Select a Virtual World to Use” to any of the virtual worlds installed. 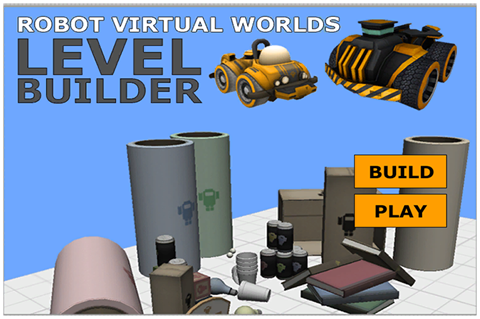 Visit robotvirtualworlds.com to explore and download more levels! If you need to go back to programming your physical robot, select “Physical Robot” from the “Compiler Target” menu. LEGO Users: Program Virtual Robots Without Downloading Anything New! 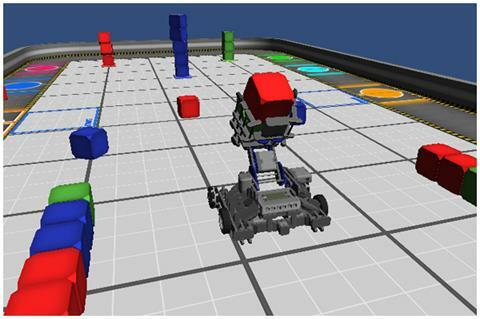 Practice your programming skills with virtual versions of popular robotic competitions or challenging obstacle courses. Practice valuable programming concepts with a variety of activities using the curriculum companion. Use the same ROBOTC code to program your real and virtual robots! The RVW Level Builder provides a 12’x12′ square field to build on and several objects – from cans and boxes to line tracking tiles – that you can use to design challenging, unique, and fun levels! Not sure how far to make your robot move? Use the virtual measurement tools to calculate the distance and angles needed to move around in the virtual worlds! 3. 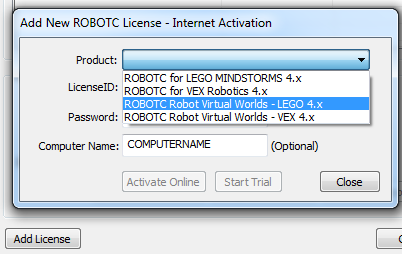 Click “Add License” in the menu and select “Robot Virtual Worlds – LEGO” from the Product drop-down. Expedition Atlantis Beta 3 Now Available! We’re happy to announce a big update to the Expedition Atlantis game. Thank you to everyone who provided feedback for the previous versions – keep it coming! One new feature that we think you’ll appreciate is the ability to create a certificate of the badges that you’ve earned, if you’ve been playing with a CS2N or Local account. It’s a great way to share the progress you’ve made in the game! To catch up on all of the latest Expedition Atlantis information, including the game unveiling and a Google Hangout with the development team, check out our Expedition Atlantis page. 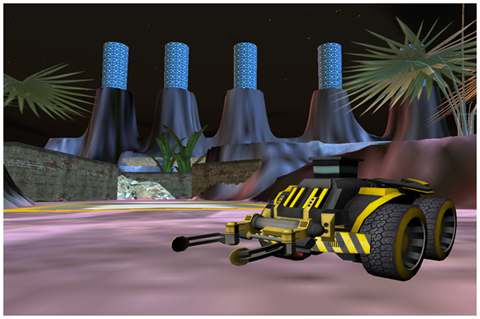 Download the latest version of Expedition Atlantis at RobotVirtualWorlds.com. The Robot Virtual World team has just released a beta version of it’s latest game, Expedition Atlantis! It’s the year 2023 and Atlantis has been discovered deep in the ocean, off of the coast of Africa. A team of elite scientists and engineers have been sent to investigate the underwater ruins, and you’re one of them! Use your skills to to maneuver the teams underwater vehicles in this expedition to Atlantis! The game begins with your submarine being deployed from a large mothership, beginning your expedition to Atlantis. A large underwater storm throws the submarine off course and into a cliff side! Fortunately, the submarine was equipped with an escape pod! The underwater storm is still acting up, so you’ll need to move the robot to areas with cover between outbursts. The mothership will transmit how far away the next safe zone is; you’ll need to calculate how many wheel rotations it will take to get there. Be careful not to move too far or too little or you’ll be blown around the ocean floor! A special training mode is available to help you learn how proportional relationships work, like how turning a number of wheel rotations translates into moving forward a certain distance. Expedition Atlantis can be played with four different difficulty levels: Cadet (Easy), Explorer (Medium), Admiral (hard), and Custom. With custom mode, you can set how many problems you need to solve in each level of the game, and how hard the problems are. You’ll also notice that there are 4 main levels to the game. After completing Level 1, the Minoan Megaliths, you’ll reach Level 2, the Pillars of Hercules. Underwater platforms appear to allow your escape pod to cross the chasm. You’ll need to calculate how much the robot needs to turn to line itself up with the next platform, before the robots thrusters engage. Be careful or your robot will thrust itself right to the bottom of the chasm! Once you cross the chasm, you’ll reach the Atlantis Base and be equipped with a robot capable of catching cargo from the mothership. The storm is still acting up and throwing the cargo off course, so you’ll need to calculate how much the robot needs to turn and move forward to catch the cargo in Poseidons Courtyard. The cargo you catch contains upgrades for your robot, which will be crucial for the final part of your mission. Take the cargo back to base to equip the upgrades! 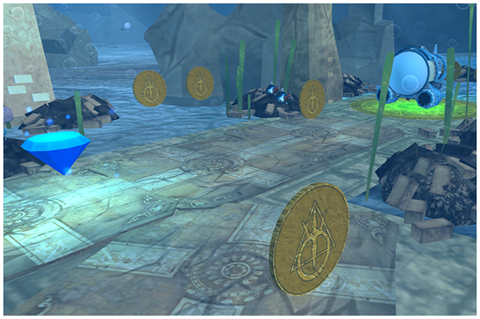 In the underwater base, you’ll be able to equip all of the upgrades that you caught in Poseidons Courtyard. Upgrades range from different wheels, different robot bodies (chassis), powerful attachments, and even paint colors. With your upgraded robot, you’ll be ready to explore the Heart of Atlantis. 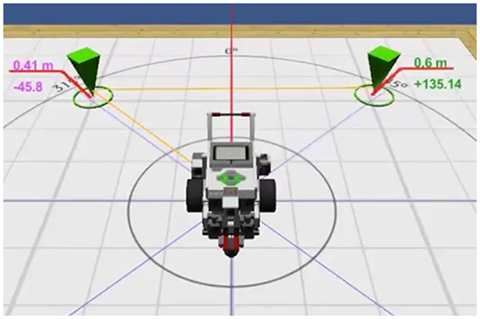 You’ll be completely in charge of marking where your robot needs to go, performing the calculations to get it there. Be careful! Ancient Atlantis was highly advanced technologically – it has a reactor core and portal network which is still operational today, but sensor readings indicate that they are unstable. Your robots radiation shield will protect it from the radiation, but will also slowly drain its batteries. As you make progress in Atlantis, you’ll be rewarded with achievements. These achievements will also show up on your “My Achievements” page on CS2N, if you logged into the game with your CS2N username! Expedition Atlantis is designed to be a fun, educational tool to teach and reinforce proportional relationships. When complete, it will be accompanied with a full Teacher’s Guide that provides information on its use in the classroom, ties into mathematical standards, and other valuable information. It’s also available completely for free during our Beta and Feedback period, so download it today! We appreciate any feedback you have about Expedition Atlantis. Feel free to share it at the ROBOTC.net Forums.